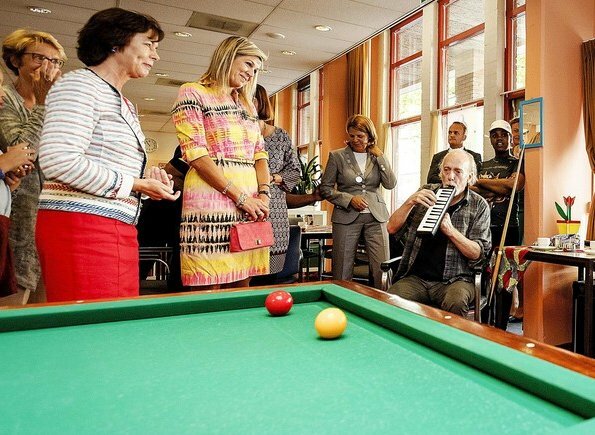 On August 22, 2017, Queen Maxima visited "Kansfonds" which is a aid fund in Delft. Kansfonds supports local initiatives and projects for vulnerable people like wanderers, children in poverty and lonely elderly people to help them change their situation and build self-reliance. This year, the fund celebrates 60th anniversary of its establishment. She looks radiant and summery. I hope she had a lovely Summer with her family and is healing from the loss of her father. Bless her for getting out to the public so soon. The dress is wrinkled, the hair is a mess, but everyone looks thrilled to be there, and that's what counts. Couldn't agree more. This woman is just glorious. She's very colorful and appears to be friendly, but to me it always looks like she's playing a role. Too many big smiles, too many colors, too much jewelry. Fashion wise, not a good choice this time. The dress is colorful but wrinkled and ill fitting, pink gloves and a very silly looking hat complete the outfit. I wonder what kind of shoes she's wearing? The silly hat and pink gloves are from several years ago. Not her best look but we'll done for for getting out there to see people who need some help. She's always friendly and seems to have the found the right way to bond with people at these occasions. Don't like the dress but then I'm not a big Natan fan anyway. The pink gloves and silly looking hat were in November 2013, in the Caribbean, not at this event. Just the same, her hair is also messy and the dress is also wrinkled. In a sense, I think all these 'royals' and celebrities are playing roles in public. I wonder why doesn't she wear mourning clothes...? In all photos of her it's evident that the people she is meeting are very delighted to see her. Her charm and bubbly personality override any faults in her clothing or hairstyle. But, that said, this dress is fine for the occasion. As for mourning clothes: I'm not sure they are worn these days. To me, Maxima comes across as a warm and caring individual. She seems to be someone who wants to put people at their ease, somewhat like the Princess of Wales used to do, but without the glamour and impeccable grooming of Diana. I am not giving Maxima a backhanded compliment. Maxima can look incredibly beautiful at times, sheer perfection in her beautiful gowns and jewels and then there are days when I wonder if she had even combed her hair. Maxima is just Maxima ...and we in The Netherlands love her!! Niet iedereen in Nederland houdt van haar. Ze wordt teveel op een een voetstuk gezet.